Since Mac OS X Mavericks was released a few days ago, there have been widespread reports of users experiencing issues receiving messages, moving messages into folders, and deleting messages within Apple’s own Mail App, especially when using the Gmail service. It seems Apple is aware of the issues and has seeded an update to resolve the issue to Apple employees and Apple’s AppleSeed customer program for testing. The Mail App shows the same Version 7.0 as the current App the public have installed as part of the OS X Mavericks installation but has an updated build number of 1822 compared to 1816. The new build fixes those issues mentioned by users together with overall stability and smart mailbox improvements. 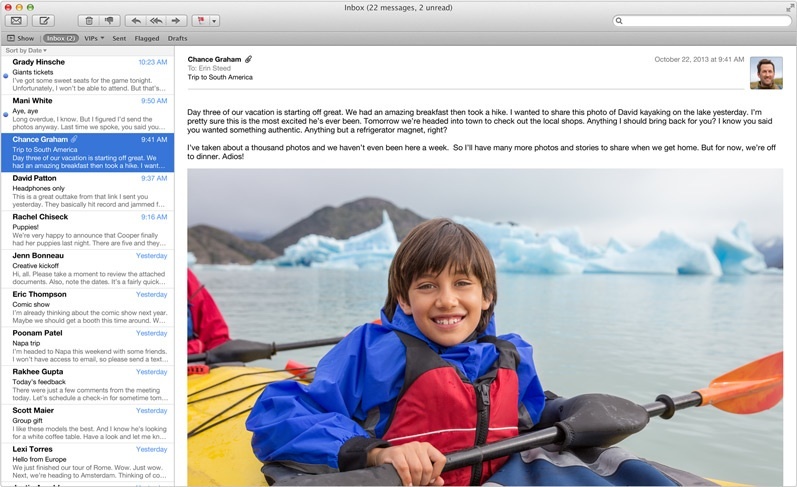 – Use Mail with your usual Mail accounts, including iCloud, Gmail, Exchange, etc. – Read and move Mail messages to folders on your mail server, folders on your Mac, smart folders. – Mark messages read/unread in both your mail provider’s webpage and Mail and verify they stay in sync. As mentioned, the update is only available for Apple employees as it is currently still in the testing phase, rather than an incremental update through the Mac OS X App Store. It is unclear if Apple plan on releasing the fix to the Mail App as a small separate update, or include it with OS X 10.9.1 when it finishes development. I personally am having numerous issues with Gmail in the Mail App, let us know if you are having similar problems in the comments section below.